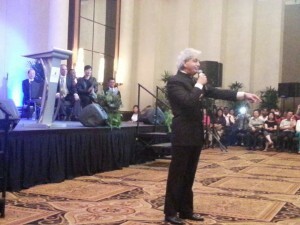 On the 8th of July 2013, I attended the Benny Hinn meeting at the Orchard Hotel, Singapore. It was a privilege to be seated in the first row. 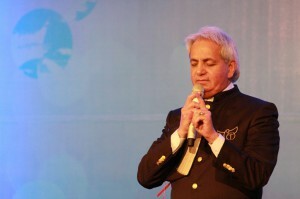 The service started at 7 pm with beautiful praise and worship by the Benny Hinn choir. The Presence of God was beautiful during worship. Pastor Benny thanked the audience for their attendance. He prayed for the families facing turbulent times and shared 3 simple steps based on his own personal trial. Make Jesus the head of your family. Spend quality time with your spouse daily. He then shared the message on the Person of the Holy Spirit. Without the Holy Spirit, we are sunk. Christianity has no power without the Holy Spirit. When Jesus walked on the earth, people saw supernatural miracles, healing, and raising of the dead but when He was crucified, the same crowd walked away. Jesus in the flesh could not change the heart of man. Not one time did the people come to Jesus and said “What must I do to be saved?”. Without the Holy Spirit, Jesus could not change the heart of man. Pastor Benny mentioned the external Jesus has to become internal Jesus for the change to come. Many Christians do not know the Holy Spirit. They have lost the connection with Him. There can be no revival without the Holy Spirit. Who is the Holy Spirit? The Holy Spirit is Jesus without limitation. He is the omnipresence of the Lord. He is the Spirit of the Lord, the Spirit of Jesus. He is the third person of the Trinity. He is a person. Jesus in the flesh could not change the heart of man but only Jesus in the heart could change the human heart. Israelites saw signs and wonders. They heard the voice of God and saw His Glory. Even after they heard and saw God, they built a calf and worshiped the calf. Pastor Benny mentioned miracles do not change the heart of men. The same crowd that saw Jesus performing miracles, cried “Crucify Him, Crucify Him”. If the apostles, being with Jesus for 3 years walked away, the chances of any man walking away from Jesus is easy without the Holy Spirit. John 14:13 Howbeit when he, the Spirit of truth, is come, he will guide you into all truth: for he shall not speak of himself; but whatsoever he shall hear, that shall he speak: and he will shew you things to come. 14 He shall glorify me: for he shall receive of mine, and shall shew it unto you. When Peter preached on the day of Pentecost, 3000 were saved, due to conviction by Holy Spirit. Holy Spirit is God Almighty. Acts 1: 8 But ye shall receive power, after that the Holy Ghost is come upon you: and ye shall be witnesses unto me both in Jerusalem, and in all Judaea, and in Samaria, and unto the uttermost part of the earth. Every religion has a message. But we don’t preach the message, we preach the living Christ. I am a Christian because Jesus lives in my heart, because of the Holy Spirit. That is why Bible says Not by might, nor by power, but by my spirit, saith the Lord of hosts. Only the Holy Spirit can change you. He is the secret to the power of God. Without the Holy Spirit, you cannot convict a non believer. When they see the manifestation of Holy Spirit, everything changes. Who’s the Holy Spirit? He is the Spirit of Jesus. Jesus is in heaven now, sitting on the throne, seated at the right hand side of the Father. Jesus in the flesh cannot be everywhere at the same time. If you want to see Him, you have to go Heaven. But the Holy Spirit is the face of Christ in your heart. He is the Spirit of Jesus. God the Father has a body. He has a shape. He was seen numerous time in the Old Covenant. Moses saw Him, Abraham saw Him, Ezekiel saw Him, Prophet Isaiah saw Him. God the Father is not invisible. Jesus is the only member of the trinity in the flesh. He has a physical body. The Holy Spirit too has a body. We are His body. 1 Corinthians 6: 19 What? know ye not that your body is the temple of the Holy Ghost which is in you, which ye have of God, and ye are not your own? After the message, Pastor Benny led the people into beautiful worship. The Presence of God was beautiful beyond description. Under the anointing, he rebuked the spirit of sickness and disease. People queued up to testify the healing miracles. He also called few people on stage including my friends. They all experienced the beautiful power of God with his gentle touch. Thank you Brother for sharing. It was indeed a GOD encounter that evening. Praise the LORD! Thank you for sharing the wonderful message and photos. My son Joshua was spinal injury during the NS training was healed .And Pastor Benny called us back to be prayed for. It was such an awesome anointing. Thank u for the picture . I do hope u have more. So glad to hear that God healed your son of Spinal injury. All Glory to God ! A US friend highly recommended Benny. Do you know whether Benny wld visit Spore for a healing ministry in 2016. I’ve a friend who surely need a miracle. Yes, I believe Pastor Benny will be visiting Singapore in 2016. I will update you the dates when I get the notice. There are good Churches in Singapore that pray for healing. Pray that your friend receives a healing miracle from our Lord Jesus. Sure, I will let you know if he visits SG. But most probably it will be next year !